Hello, hello! Another day, another weekend recap. Friday felt busy, but I’m not really sure why. The most notable task I accomplished was setting up a bank account for my freelance business. It’s taken a lot of work filing the right paperwork, meeting the right people, setting up the right accounts to get this business up and running but I’m finally ready. After the meeting at the bank, I grocery shopped, went to the pet food store, bought various Christmas items…it was kind of a blur. 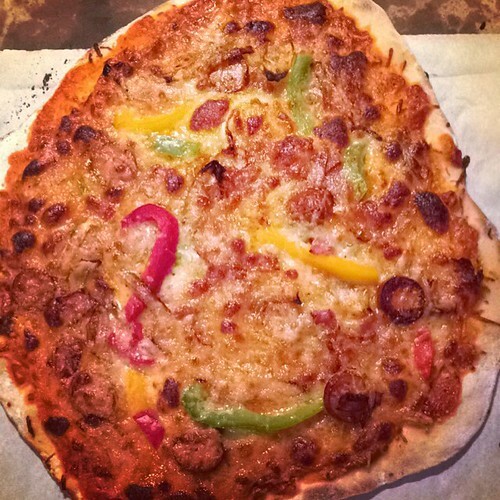 We decided on homemade pizza for the night, which is our favorite way to spend a Friday night. We got our butts to the gym Saturday morning. We’re both finally getting back into our gym routines after taking a I-don’t-want-to-admit-how-long break. I can blame moving right? After gymming and showering, we headed to Uptown to go to Hopdoddy Burger Bar. Uptown is an upscale neighborhood where many young professionals in the city live. Ryan looked at apartments in the Uptown area when we first learned we were moving here, but we ended up deciding we would prefer more space for our money. It would have been fun to live in this area for a year or so, but with a dog and the price it just wasn’t worth it. 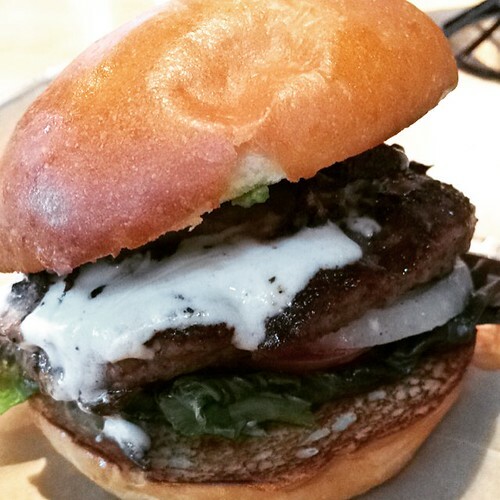 Hopdoddy originally started in Austin, Texas, but now has several locations in Texas as well as Colorado, California and Arizona. It’s a slightly upscale burger restaurant. We actually live closer to one than the one in Uptown, but we had other plans to shop around in Uptown. I ordered the Magic Shroom burger, which had local goat cheese, field mushrooms, mayo, and basil pesto. So good. 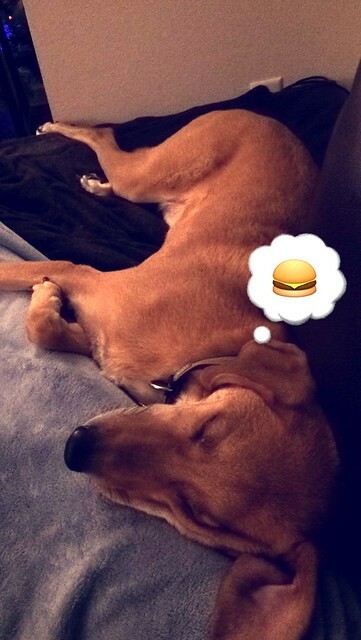 I’d like to try a lot of the other burgers too, so I’m sure we’ll be back. 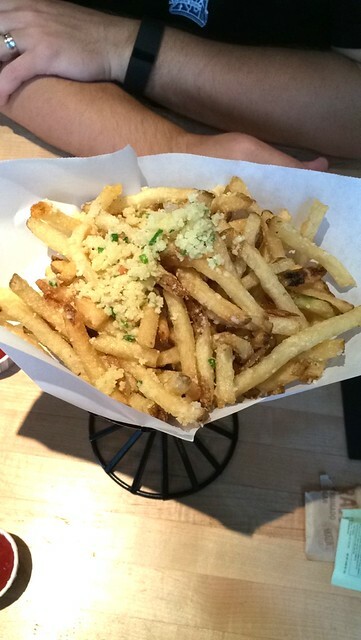 We also split the Parmesan Truffle Fries with a garlic aioli, though I preferred dipping them in honey mustard. After we were fueled with burgers, we went to Dolly Python, a vintage clothing store with antiques, odd little trinkets, and cowboy boots. We didn’t end up buying anything but they definitely had some interesting pieces! Once we were done at Dolly Python, we drove around the Highland Park area to look at houses. This time, we knew what we were getting ourselves into, unlike last time. Highland Park is a very expensive area to live in (think three car garages, six bedrooms and cost well over a million dollars). Pretty to look at but in no way realistic. Later in the evening we didn’t really do much except get dinner at the Whole Foods salad bar and watched more episodes of The Americans. Thrilling lives that we lead. I can’t let this post continue without sharing a picture of Murphy, so here’s what he did all Saturday evening. We tried out another new church on Sunday. It’s funny, because once we mention Hales Corners Lutheran to people here, a lot of times the pastors have heard or even know people from HCL. Crazy what a small world it is! We plan on to continuing to try out different churches, and maybe repeat attendance to some. We never realized how lucky we were to find HCL on the first try. After church, we FaceTimed with our nephews in Connecticut, which is always fun. They were telling us about the shapes they like to cut, their new scissors, barking like Murphy…the usual. 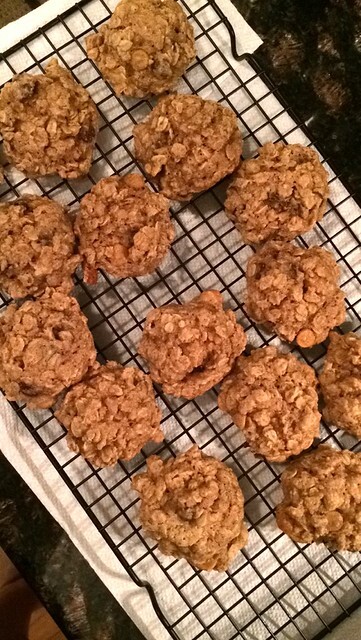 I’ve been wanting to bake some cookies for awhile now and finally had the time to get it done. I used this recipe, except I did half butterscotch and half chocolate chip. Also, don’t almost forget the flour like I did. Eek. We ended our weekend with looking at the Every Dollar financial management program. In the past month (if I’m being honest…the past like, two weeks) we’ve tried out both You Need a Budget and Quicken and both were not cutting it for us. I know many people have found these programs useful, but when comparing to the way we like to budget neither were doing the same as we had plus more, so it seemed like a waste of money. We started looking at Every Dollar and I think this might be the one for us. Everyone manages money differently, so my suggestion would be to do what works for you! Dallas, Featured, Restaurants baking, every dollar, Hopdoddy, pizza friday, Uptown, whole foods. permalink. Church hunting is so overwhelming. Someone once gave me the advice to at least try 3-4 services at each church to really get a good feel it, which was helpful for me but draws out the process for sure. I’m going to have to check out the Every Dollar program. I’m intrigued. I still keep my massive spreadsheet religiously but I’m not so sure I stick to actual budgets like I should. Yeah, I think going multiple times is a must, just time consuming. We still have used our spreadsheets system, but are finding we want a little more visual aspect instead of just cold, hard numbers. Once we get the feel for Every Dollar and if we end up using it (they have a free and paid version) I might do a review on the blog. Yay! Dolly Python! B and I loved that place. I got an awesome vintage scarf. BTW, I love these posts! Keep ’em coming!